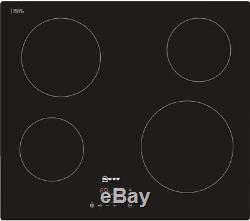 NEFF T10B40X2 Electric Ceramic Hob - Black - Currys. Kitchen Appliances > Built-in Appliances > Built-in Electric hobs. Brand new & pristine product. Use the black Neff T10B40X2 Electric Ceramic Hob for a versatile cooking solution. Four-zone hob You'll be able to comfortably accommodate pots and pans of different sizes on this ceramic electric hob with four cooking zones of various dimensions. The appliance offers 17 power levels across the cooking zones, so it's more than a match for all your cooking requirements. Confident home cooking A ReStart function makes using the T10B40X2 Electric Hob even more convenient. Should it be accidentally turned off, you can still recall all settings (including timer setting) for up to four seconds just by pushing the main switch. Front-mounted touch controls allow you to operate the hob effortlessly, and you won't have to stretch over sizzling pans and bubbling pots to reach them. An LED display has been provided for each zone, so you can see the temperature they're set to there's also a timer for each ring, plus a switch-off function and acoustic signal that help you to stay in control of each element of those multi-part meals. Safety first in the kitchen This Neff T10B40X2 Electric Ceramic Hob includes two-stage residual heat indicators which keep you and your family safer by alerting you when the hob surface is too hot to touch. A child lock prevents any unnecessary changes to or activation of the control panel and each zone features a safety timed switch off so that it doesn't remain on indefinitely. Offering a sleek, frameless black design that's easy to wipe clean, the Neff T10B40X2 Electric Ceramic Hob makes a practical and stylish addition to your kitchen. All Currys/PC World Outlet guarantees are non-transferable. Hob power: Front right: 2.2kW, Front left: 1.2 kW, Back right: 1.2 kW, Back left: 2 kW. Safety features: Hot hob indicators, Child lock, Safety switch-off. Installation: Please note this product should be installed by a qualified engineer, such as one of our Knowhow experts. Minimum distance required / Minimum clearance above hob: 650 mm. Dimensions: 51 x 592 x 522 mm (H x W x D). Recess dimensions: 45 x 560 x 490 mm (H x W x D). Boxed dimensions: 100 x 590 x 750 mm (H x W x D). Boxed weight: 8.1 kg. This product has no reviews yet, however see what our buyers say about our other products.. We deliver within the UK only, this excludes the Republic of Ireland, the Scottish Highlands, Okrney and the Channel Islands. Warehouse/store pick-ups are not available. All days & time slots are subject to availability. We can install your new appliance on the day we deliver, for most of the UK. Installation is only available for NEW Big Box Appliances & Electricals. The item "NEFF T10B40X2 Electric Ceramic Hob Black Currys" is in sale since Wednesday, October 25, 2017. This item is in the category "Home, Furniture & DIY\Appliances\Cookers, Ovens & Hobs\Hobs". The seller is "currys_pcworld" and is located in Newark.